As they prepare for the swap, Jack is contacted by Jolli, who needs help returning to the ship, but he refuses to give it, worried it'll interfere with his plans. 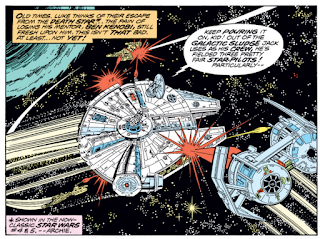 Outside his ship, protected by its magnetic field, Han and Jack make their exchange, but once Jack has what he needs, he signals his ship to narrow the field, cutting Han off from the Falcon as his pirates pour out after him. Just then, Jolli returns, enraged that Jack left her to die, targeting his men and crashing into the munitions deck, crippling the ship. 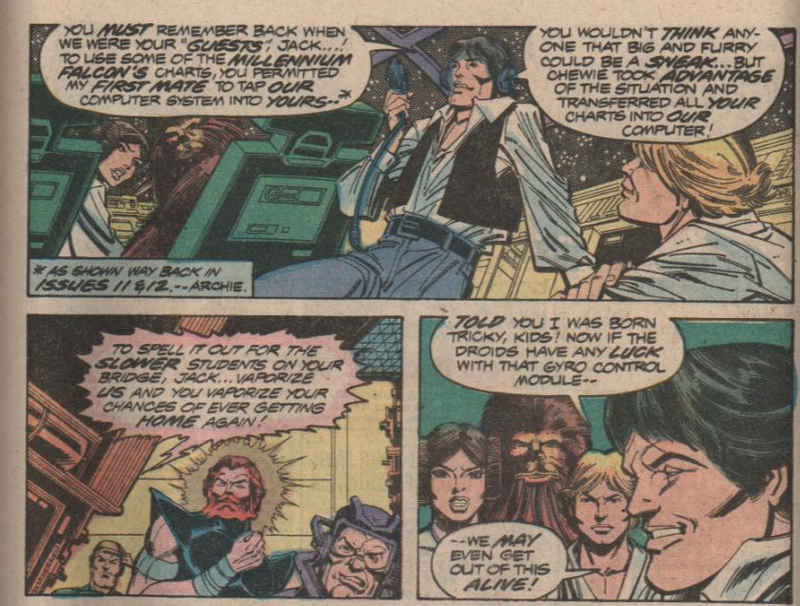 Jack survives the explosion but is blasted by Han, after which he and the needed module are picked by the Falcon. Later, searching the wreckage of Jack's ship, Han and Leia find the dead Jolli. Han kisses her goodbye, then everyone sets off for the long journey home. The conclusion to the "Doomworld" storyline, this issue also sees the apparent end of both Crimson Jack and Jolli, the latter sacrificing herself to help Han by taking out Jack, after Jack left her for dead. I have no idea if either character pops up again later in the series (this is comics, so it's possible), but it certainly seems like readers are at least meant to assume they're both dead at this point. 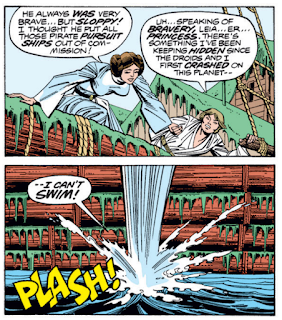 Luke reveals in this issue that he can't swim, a condition he's been doing his best to overcome while trapped on a water planet. Which, of course, makes sense for someone who grew up on a desert planet. 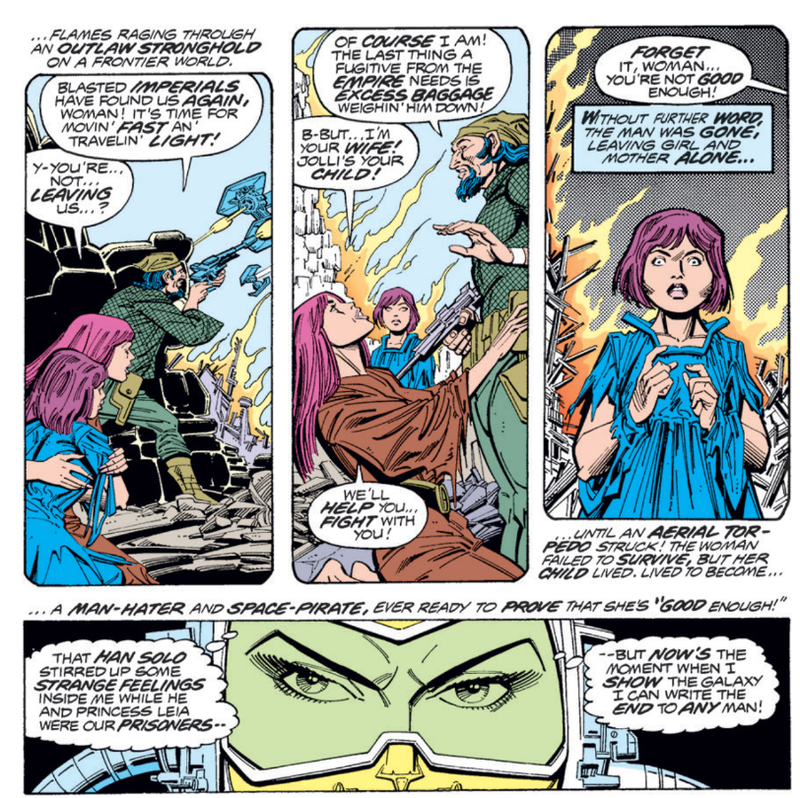 Just in time for her death, we learn a little bit more about Jolli, specifically that she and her mother were abandoned by her father on a war-torn world when she was a girl, leading her to constantly try to prove herself and to her hatred of men. It's established that the magnetic field around ships (presumably what we'd think of as the ship's shields) offer protection against some elements of outer space. People still need breathing apparatus (as the field doesn't create any air), but they can travel through space with exposed skin and without any kind of spacesuit. The "Fire Rings of Fornax", an exclamation coined by Roy Thomas, is used again. 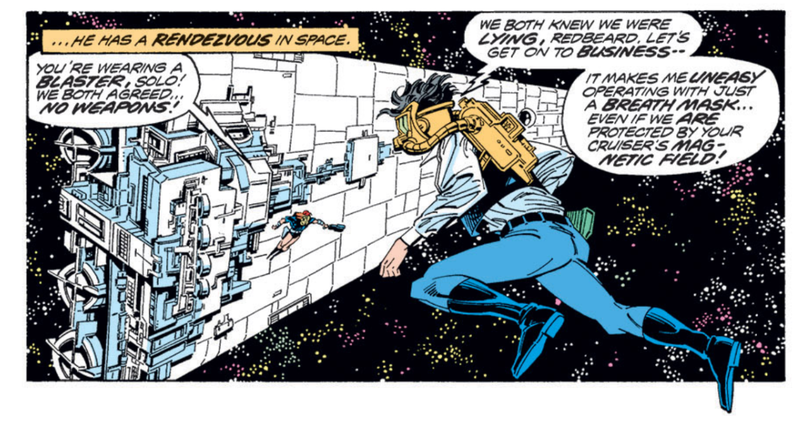 Once again, characters repeatedly refer to entering hyperspace/jumping to lightspeed as "going to warp". 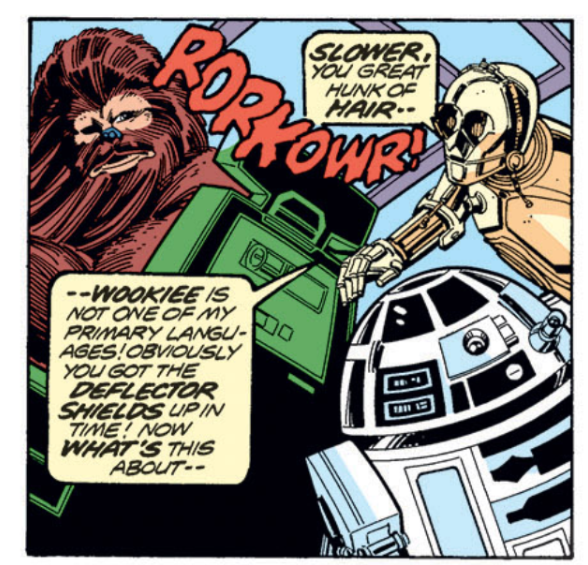 Threepio claims that Wookiee isn't one of his primary languages, though he had no issue understanding Chewbacca in A New Hope (also, the official name for the Wookiee language would later be named "Shyriiwook", not "Wookie"). As the Star Warriors face off against Crimson Jack's forces, the Millennium Falcon's escape from the Death Star and pursuit by TIE fighters following Obi-Wan's death is recalled, first via dialogue and then outwardly in the narration. Heading out to make the exchange with Jack, Han tells Luke to look away so he can kiss Leia goodbye without feeling guilty. The navigation data Han stole from Jack is apparently stored on tapes of some kind. Really nice cover on this issue, one of the best so far (and the apparent goof of Han operating in space without any kind of protection aside from a scuba-like breathing apparatus is actually addressed in the issue itself). 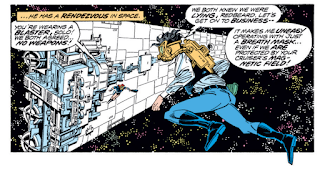 Also, kudos to Infantino for not always drawing the ships in space on a horizontal plane relative to the figures in space. The formal conclusion to the "Doomworld" arc, this issue puts to rest, seemingly for good, Crimson Jack and Jolli, the two most significant original creations of the series thus far. 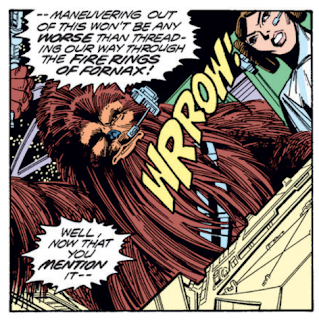 In the case of Jolli, who became an increasingly problematic character the more we learned about her (here falling into the "scorned woman vows to prove herself to men even while hating them" trope), this is probably for the best, but its a shame to lose Crimson Jack, who, outlandish appearance aside, made a good foil for Han and an effective non-Imperial-yet-still-recurring antagonist for the rest of the heroes. 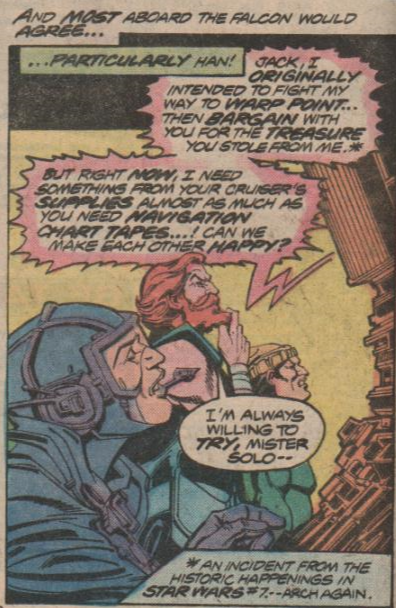 Plus, the idea of a pirate working out of a captured Star Destroyer is pretty great (so much so that the later Expanded Universe will return to it, with Booster Terrik). Long term implications aside, Goodwin & Infantino carry over the energy and momentum of the previous issue into this one, once again providing an action-packed and well-rendered story. It's actually really well-constructed, for the way it works as both a single issue (the immediate conflict with Jack is introduced and resolved within these pages), a chapter in the larger story (the immediate conflict is triggered by events in earlier installments of the storyline), and as a piece of the larger series' narrative (in that the Han/Jack conflict is informed by their previous encounters, and Jack's death means something for the future of the series). It's not too unusual to see a single issue of a comic manage to accomplish two of those feats (though far too many comics nowadays manage only one), but it's rare, even in the 70s and 80s, to find one that does all three. It's a testament to just how well Goodwin & Infantino are clicking, coming out of their first big storyline on the book. 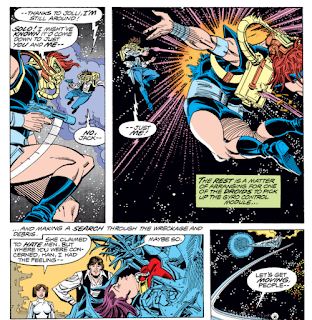 The debut of Valance the Hunter, the return of the Star-Hoppers of Aduba-3, and Walt Simonson! That is a good cover. And ditto the above as well as the rest of your analysis. I’m a little disappointed to see the blaster fire depicted as continuous beams, though, rather than the staccato blips seen in the movies. Okay, I'm all caught up again. Once more I'm going to try and keep pace with you, reading an issue a week. We'll see how it goes this time. I've gotten so used to binge-reading comics these days, that reading with breaks -- even short ones, like a week -- has become hard to do! Despite Goodwin's justification, I'm a little iffy on the science that allows Han and Crimson Jack to survive in space outside their ships. It doesn't feel very STAR WARSish, possibly the first really noticeable such misstep on Goodwin's part. Flipping ahead a bit in my Omnibus, I'm a little sorry to see we're losing Infantino for a couple issues (even if we do get Simonson as a fill-in next time), and that when he returns, Terry Austin isn't coming back with him. The upcoming Infantino/Gene Day combo looks fine, but Austin gave Infantino a really beautifully polished look. In the Omnibus especially, even more than on the screen through Marvel Unlimited, the pictures are amazingly crisp. I doubt any future issues will look as nice to me as these past few, though I know I'll continue to enjoy Infantino's output. By the way, I've been wondering: some of your images are clearly scans of the actual comics, while others appear to be pulled from Unlimited. What's the story there? @Blam: I’m a little disappointed to see the blaster fire depicted as continuous beams, though, rather than the staccato blips seen in the movies. I wonder if that's just a holdover from traditional comic book style? 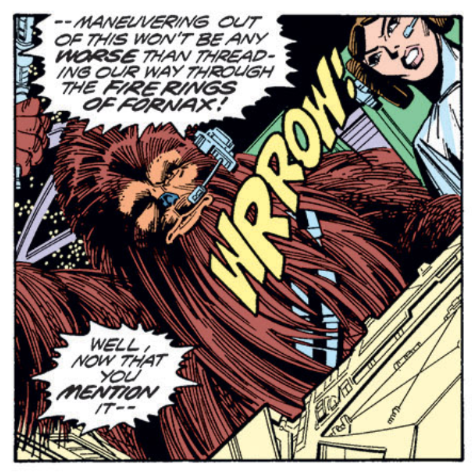 In fact, I wonder how familiar Infantino was with the movie at this point, if he'd even seen it to know how the blaster fire works there? @Matt: Despite Goodwin's justification, I'm a little iffy on the science that allows Han and Crimson Jack to survive in space outside their ships. Oh, it's still a little doofy, to be sure. I just appreciate the effort in at least trying to explain it. 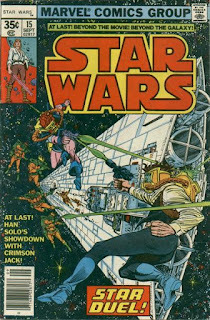 I noted the cover, was like "that's great, except for Han not wearing a space suit" and then was pleasantly surprised to find that flaw addressed in the story itself. 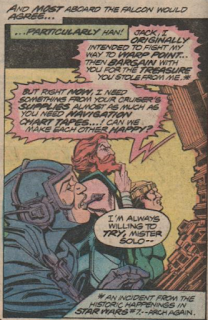 I'm a little sorry to see we're losing Infantino for a couple issues (even if we do get Simonson as a fill-in next time), and that when he returns, Terry Austin isn't coming back with him. Is Austin gone for good? I feel like I saw that he comes back at some point, but maybe not. Heh. I've been waiting for someone to notice that. So here's a little peak at how the sausage is made, so to speak. I've actually had this project in mind for a long time, long before these issues became available on Marvel Unlimited (in fact, even before Disney acquired Lucasfilm), and as such, I acquired a set of digital issues via...means, so I wouldn't have to try and scan my old Dark Horse collections of the series (the ones that predate even the Dark Horse omnibuses of the same). But of course, by the time I actually started the series, the Disney deal occurred and the issues were made available in MU. So my process when writing up an issue is to first read it on my iPad via MU, taking notes and screencaps along the way. Then, I write the post on my laptop, and use the non-MU digital issue as a guide for the plot synopsis (since they're easier to get to locally than the MU files, and I'm not a huge fan of the MU desktop interface) and also to look for stuff like letters pages and ads (which get left off MU but are intermittently included in the digital copies I have). That's usually when I take a screencap for the middle of the plot synopsis, as I don't know until I write it exactly where the cutoff will be and what image to use. So the plot synopsis image (and ancillary stuff) is usually taken from the scanned digital file, whereas most everything else is from the MU version (sometimes, when touching things up, I realize I missed a note or screencap, and will pull it from the scan, because I already have it up). Incidentally, you can sometimes see the same mixed image source phenomenon in my X-aminations posts, usually with Excalibur and Wolverine, the two series I read almost exclusively via MU and thus follow the same process as above, which sometimes leads to plot break and/or ancillary images being taken from scans as opposed to the MU version (though we've now entered a curious gap in MU's coverage of Wolverine, as the early Hama issues aren't there yet, so it won't happen there as often). Whereas Uncanny, New Mutants, & X-Factor, all of which I started screencapping via scans, I stick with the scans for the sake of consistency. As far as letters pages and whatnot from the original issues (or scans thereof), by the way, I’m glad you mentioned that because it reminded to share a Chaykin pin-up from #3 that Bully posted recently. It might be in the tabloid reprints, but since Marvel put the series online right as you started I never bothered puling those out; unfortunately, it’s not in the digital edition. Chaykin’s style is much more evident here and the characters are much closer to model with, as Matt said about Infantino's work, that boldness of style making up for the imperfect likenesses. @Blam: I’m glad you mentioned that because it reminded to share a Chaykin pin-up from #3 that Bully posted recently. Regardless, you're right that it's much closer to Chaykin's style, moreso than probably anything else he drew for the series aside from maybe the early promotional poster. The pin-up is included in the Omnibus, and I believe it's presented there at the end of issue 9. I'd have to check for sure when I get home. Teebore -- "Is Austin gone for good? I feel like I saw that he comes back at some point, but maybe not." It's possible he comes back eventually, but I was just flipping a few issues ahead and saw mostly Gene Day. 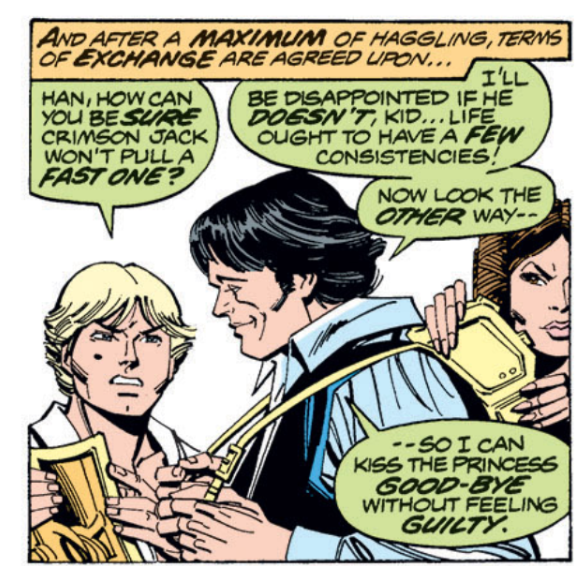 And I know Tom Palmer comes back for a long run, but that might not be until after the EMPIRE adaptation. Thanks for the run-down on your process! My first guess was that you wrote these things up with a few scanned images, then added to them with the MU stuff when it became available. Seems the real story isn't that far off. I'm a little jealous that you have the letters pages, by the way. I always miss those in collected editions. Marvel's Silver Age Omnibuses usually contain them, but that's generally it. I should clarify: it's in the recent Marvel Omnibus, which I'm reading, not the old Dark Horse Omnibus (though I guess it could be there too; I don't own that). @Matt: I'm a little jealous that you have the letters pages, by the way. Don't be too envious; it's a pretty hit or miss whether an issue has them (or any other ads/Bullpen Bulletins/etc. ), so much so that if an issue doesn't have a letter col, I never know if its because that issue didn't run one, or it just didn't get scanned. Love seeing the original scanned pages, Teebore, as that's what I have, all 107 (+3 Annuals) of 'em! Beautiful old comics! I've got a nice large flatbed scanner if you ever need an embiggened future issue, by the way! @Erik: I've got a nice large flatbed scanner if you ever need an embiggened future issue, by the way! Thanks for the offer! I may just take you up on that at some point.